Intel’s Tiger Rapids is a reference design of a 7.9-inch dual-display tablet with an E Ink display and pen support. The prototype is quite amazing. Here are my first impressions. I’m at Computex in Taiwan right now and Intel used the trade show to showcase a reference design of a dual-screen tablet. They call this project Tiger Rapids and the tablet consists of two 7.9-inch displays. One of them is a standard IPS panel while the other one is an E Ink display. Both support pen input. As I said, it is a prototype and will never be available exactly like this. Intel started this design in 2016 and has been showing it to its hardware partners since then. In fact, one partner jumped on board already and will bring something like this to market. So, we’ll never see this exact tablet, but something very similar. Let’s take a closer look at this dual display tablet. 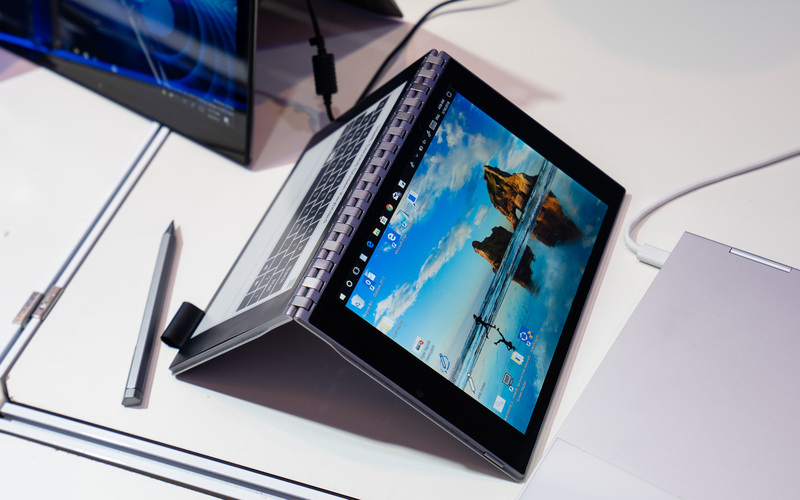 It consists of two 7.9-inch displays that are bound together by a hinge. One of them is a standard IPS LCD panel with a resolution of 2048 x 1536 – just like an iPad Mini. The other one is an E Ink display similar to what you get with most E-Book readers. Both are touchscreens and you can write on both with an active pen. And that is what it is made for. The E Ink screen even gives a little resistance when writing on it – almost like real paper does. You can use the E Ink display as a secondary notebook or as a keyboard or handwriting input. And I’m sure you can read books on it too. The other side of the tablet looks like a Windows PC. Well, like an 8-inch Windows tablet. But unlike most of those, there is quite powerful hardware inside. This Tiger Rapids prototype comes with a 7th generation Intel Core processor. It is an energy-efficient Y series chip. In addition to that we get a 128GB SSD – yes, a real SSD and no eMMC storage. Well, this is the hardware of this prototype. The final product would have an 8th generation chip. We’re getting a camera on the back, one single USB C port, and even a little pen loop. Intel also made a leather case for this reference design. I’ve been quite impressed with this dual display convertible. It is surprisingly lightweight, very thin and the stylus works quite well on the E Ink display. I also like that we get powerful hardware and not some weak Atom or Gemini Lake chipset. According to Intel, a final price of 599 to 699 US Dollars is possible. And that includes a profit margin for the manufacturer. Well, as I said, this is a prototype, a reference design to show around. One of Intel’s partners is going to make something similar but we don’t know if it’ll have the exact same hardware. And I’m kind of suspecting it will be a bit pricier than 700 Dollars.